Well, it's certainly no secret how much I love Procol Harum. It's no secret how much we all love Procol Harum, except maybe to the outside world! Several years ago I developed another passion ... orchids. My attempt to raise these magnificent treasures of the Universe is where my tale begins. Mention the word 'orchid' to anyone other than another orchid-fancier and you realise just how misunderstood they are. Mention the band Procol Harum to anyone other than another Procol Harum-fancier, and one might as well be verbally challenged just trying to get them to pronounce the name – and that rings true for most technical orchid names as well. Need I mention the correct spelling? I will admit to falling short in the orchid world, but ... Proul Haven? I suppose anyone with a devoted hobby or interest could find correlations that would mesh it with their favourite music if so inclined, but Procol Harum doesn't record and play just ordinary music:and orchids aren't your ordinary plant. I believe the beauty of the orchid and the beauty of Procol Harum go hand in hand. From the 'roots' of their extraordinary influence to their strength and longevity despite the elements, they have sustained and continued to grow. No matter how many mutations Procol Harum have evolved through over the years, so does an orchid through its backbulbs encourage its new growth. An orchid is an exercise in patience, and, whether the bloom develops for a day or for several months, it is magically everlasting and memorable much like Procol Harum. 'Captivating', 'exotic' and 'mysterious', among other terms, have many times described these two treasures, but this wasn't intended to be a botany lesson so I hope you didn't mind my need to express this observation. However ... What it really is is my way to say 'thank you' to Andy Easton of the American Orchid Society who one day took the time to hear my plea as I searched for someone to sponsor and name an orchid after our beloved Procol Harum. He has granted my wish, dear Palers, and it is now official: the hybridisation of Cym. Mighty Sensation with Cym. Electric Ladyland has produced the orchid, Procol Harum ... a flower for the world to behold forever. On 25 May 2002, following Mr Easton's generous acknowledgement of Procol Harum the Orchid, Gary Brooker entered the stage along with the members of the band in celebration of their 35th Anniversary of A Whiter Shade of Pale at Fairfield Halls in Croydon and announced quite to my surprise and delight that the band woud be performing the evenings setlist from 'The Book of Orchids' which consisted of a folder adorned with a picture of this glorious Cymbidium! Because of my inability to attend this celebrated event, I was quite moved to learn Gary had taken this honour 'in the spirit in which it was made' much like the very first recording that connected us from the onset. I look forward to the day the plant will be available to 'cool' growers everywhere and hope it will also arouse curiosity in music lovers everywhere as well. Shine on Mr Easton, and thank you from the bottom of my heart! From Orchids (A Golden Guide) by Floyd S Shuttleworth, Herbert S Zim and Gordon W Dillon. Revised by Alec M Pridgeon. Western Publishing Co. Inc. Racine Wisconsin. And of course the picture of the Procol Orchid ended up on the front cover of Gary Brooker's book of songwords that he takes on stage, and apparently doesn't refer to! Both amateur and commercial growers develop new hybrids, name them when they bloom and register the names. Thereafter, all plants originating from that cross or other crosses between the same parents bear that same hybrid or 'grex' name. There are definite procedures that must be followed to register a cross officially. Originally, the registrars were the British orchid firm of Sanders Ltd. Registration now is done by the Royal Horticultural Society in England and all new names are printed in the English journal The Orchid Review. To register a new orchid hybrid, an application form must be filled out stating genus and proposed name of the hybrid along with parentage of the cross. Application must be by the orginator or with permission. Other data required include the date of the making of the cross, the date of the first flowering and description of the first flowers. If it is approved, it appears in The Orchid Review. 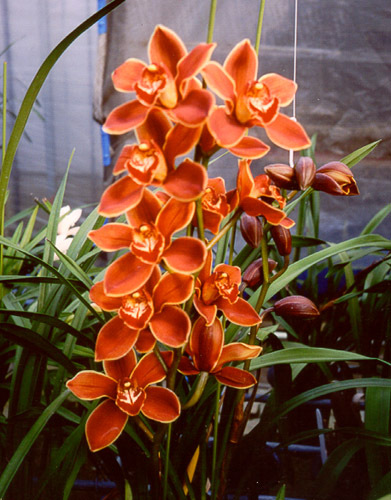 A compilation of such registrations is published every five years called Sanders's List of Orchid Hybrids. Computerisation of the list will facilitate reference and new entries.